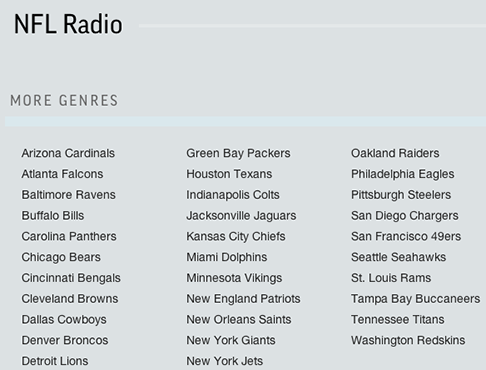 Looking for ways to listen to your favorite NFL team’s games each Sunday? We’ve gathered together a collection of resources to get you that audio feed. 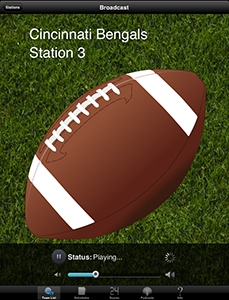 The new domestic version of NFL Game Pass provides live and on-demand radio streams of all NFL games. It also will allow you to watch on-demand NFL Games the day after they are broadcast. Unfortunately, the price is $99, and if you only want the audio portion, that’s more than a little pricey. Check out NFL Game Pass for more information. 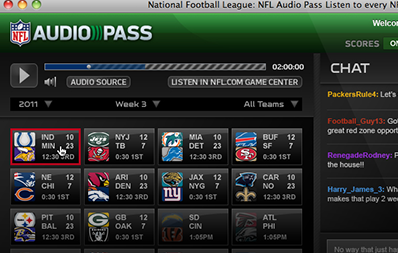 NFL Audio Pass gives you access to both live and on-demand archived NFL games over the Internet. 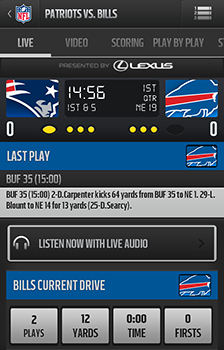 You can also port your subscription to your mobile device or tablet and listen on the go with the NFL Mobile App. (Note: Verizon customers get audio access for free). Users can choose the home, away, or Spanish language broadcasts. It does not include the playoffs, which is available via a separate playoff subscription during the latter part of the NFL Season. There are a handful of subscription options. The Season Plus is probably more than most fans will need. For $29.99, you get complete access of live and archived games from the Preseason through July 31 2014. The Season package ($19.99) gives you the same access, but only through the regular season. The Season subscription ends January 10th 2014. “Follow Your Team” gives you access to just your favorite team through January 10, 2014. There is a also a monthly option that gives you complete access, but only for 30 days. They don’t run commercials during breaks, but background music instead. It’s been a few years, but back when I subscribed to NFL Audio Pass, they didn’t edit out the commercial breaks in the archived games the way they do with NFL Game Rewind. 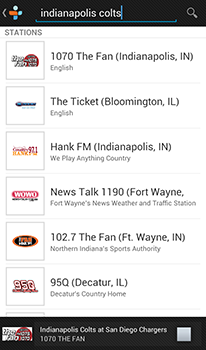 TuneIn Radio is my go-to app as well as my go-to website for finding live audio streams. The good thing is that TuneIn aggregates live streams of thousands of radio stations and organizes them by team. Plus, you can listen for free. The bad news is that not all of the feeds stream the games and it can take some trial and error to find a good stream of the game you want to hear. 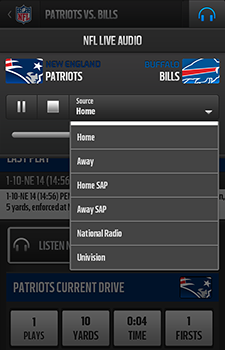 Choose one of the teams for the game you want to hear and then select the radio network feed. It’s very likely you will need to check several links before you find one that actually streams the game. Many of the streams will be broadcasting alternate programming or a message about how the live stream of the game isn’t available online. You can find all the live audio feeds in the NFL section at tunein.com. If you have are a Verizon Wireless subscriber you’ll get live streams of every NFL game to your mobile phone. The stream can be difficult to find if you don’t know where to look. You’ll find the link for each specific game by going to Scores, and selecting the individual game. 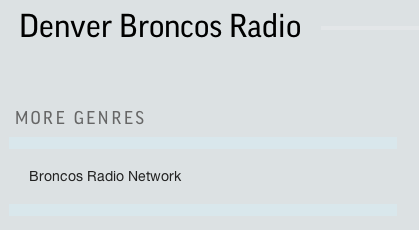 When the game begins, you’ll see a link to “Listen Now with Live Audio.” You’ll have the option to select Home or Away feeds and Spanish Language and National Broadcasts when available. Check out NFL.com/mobile for more info or to download the app. 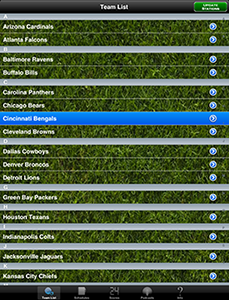 For a small fee of just $0.99 the Pro Football Radio and Scores app delivers live feeds of every NFL game. It isn’t much to look at but the functionality is rock solid, which is what is most important. Each team has a collection of feeds. It’s normal to find some of them aren’t working, but the developer does a great job of updating the feeds for all NFL teams and I’ve never had an issue finding a game. It’s available for iOS and Android. Finding games in the TuneIn app can be tricky. My advice to do a search for your favorite team. 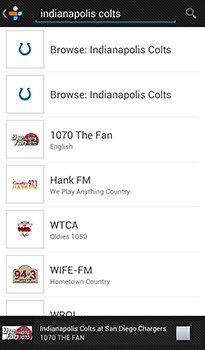 For example, “Indianapolis Colts.” Select “Browse Indianapolis Colts” (or whatever team you like), and select from the presented radio stations. You might want to save one to your favorites to avoid having to go through the process each time you want to listen to a game. Download TuneIn Radio for iPhone or Android. These live streams are great for simply listening to the game if you are on the go or can’t otherwise watch. A big downside that I’ve noticed with these Internet streams is there are very difficult to sync up with your TV. If you just want to listen to your team’s local broadcast while watching on TV, it can be a frustrating experience. Even with a DVR, I find myself having to to adjust the sync at almost every commercial.